Fans got their monies worth Friday, July 17th as they were treated to a full night of racing plus three make up features from the rained out races of June 19th. The make-up feature for the Hobby Stocks kicked off the night with John Gartner Jr and Roy Erickson on the front row. Gartner Jr. cleared Erickson to lead lap one but Erickson rallied back to race door to door with Gartner Jr. They raced hard for the lead for several laps which helped third place Wyatt Rath-Wald quickly catch the leaders. Gartner Jr. lapped the first car of the night but second place Erickson made contact with the lapped car, leaving his car spun on the frontstretch with six laps to go. Erickson was forced to pit for a flat tire, ending his chance to pick up his first feature win of the year. On the restart, Gartner Jr. and Rath-Wald raced side by side for the win as Josh Roehrich lurked in third. As they took the white flag, Rath-Wald cleared Gartner Jr. for the lead. In a last chance effort, Gartner Jr. threw it hard in turns three and four but Rath-Wald held off Gartner Jr. at the Open Road Honda finish line to win feature number four of the season. Josh Roehrich finished third ahead of Nathan Messer and Jaren Wald. Pole sitter Ivan Sailer led from the start in the INEX Legends make-up feature. Second place Brian Hanson had his hands full with Troy Hoff, Donavin Wiest and Paul Morman. Hoff slipped by Hanson, bringing Wiest with him. It was a three car breakaway as Sailer, Hoff and Wiest battled hard for the lead. As the leaders raced into turn one, Hoff clipped Sailer's left rear bumper. The contact left Sailer's car sideways but the veteran racer saved the car and continued to lead with five laps to go. Hoff and Wiest were still all over Sailer's rear bumper. With two laps to go, Hoff drove his car low under Sailer but Sailer's high line around the track prevailed. Sailer won his first feature since 2012 over Hoff and Wiest. Kevin Jensen edged at the finish line Drew Papke to finish fourth. 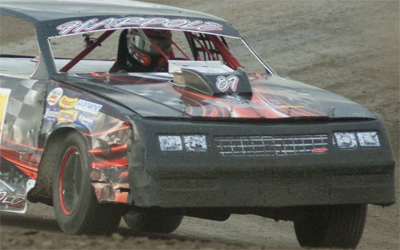 The rookie Brad Hellman led the field to the green flag in the WISSOTA Street Stock feature. Hellman led the first three laps before a strong Eric Harpole snatched the lead on lap four. Hellman started to fade, losing positions to Shawn Becker and Jeremy Schmidt. A lap seven caution put Becker and Schmidt on Harpole's rear bumper and on the restart, Schmidt powered by to take the lead before a series of cautions slowed the pace. On the final restart with nine laps to go, Schmidt and Harpole pulled away from the field as Becker had his hands full with a fast Chris Michaelsohn and David Falkenstein. As the laps wound down, Becker would hang on to finish third ahead of Michaelsohn and Falkenstein while Jeremy Schmidt held off Eric Harpole for the feature win. *After the conclusion of the WISSOTA Street Stock feature, Jeremy Schmidt was disqualified for failing to scale his car after the race. 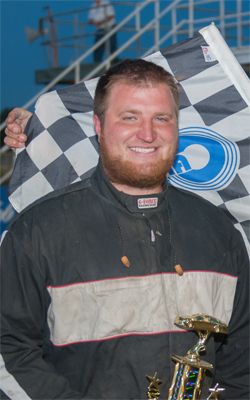 Eric Harpole, who finished second, was credited for the feature win. After three great make-up features, a regular night of race commenced. The IMCA Sport Compacts were the first feature before intermission. Kody Stoxen stormed to the front as the field tried to maneuver around the pole sitter Josh Houn. While trying to get around the slower car, Chance Seelye spun in turn one. As Seelye tried to get the car rolling again, Josh Roehrich spun on the backstretch. The caution flag waved but as the cars entered turn three, Tom Dworshak's car took a sharp right and rolled over on it's side once before resting on all four wheels. On the complete restart, Jason Berg took the lead before getting squirrelly in turn two, allowing Roehrich to slip by and into the lead. Berg battled hard with Stoxen for second while Brandon Anderson lurked behind. Berg's car had a wicked twitch for several laps before loosing his right front and right rear tires in turn three with six laps to go. On the restart, Roehrich pulled away while Stoxen and Seelye race side by side for second. Seelye would win the battle but ran out of time to chase down Roehrich. 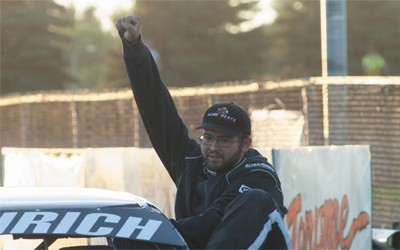 Josh Roehrich picked up his third feature win of the year. Kody Stoxen finished third as Chase Schlafmann and Brandon Anderson rounded out the top five. Dylan Thomas and Thayne Maher split pole sitter Robert Sigman for the lead in the Hobby Stock feature. Sigman got loose in turn one, spinning off the track and causing the first caution. On the complete restart, Thomas led the field to the green flag but drifted too high in turn two, allowing Keith McCleary, Maher and Wyatt Rath-Wald to slip by and battle for the lead. Maher's car was too tight and lost third place to Brent Vetter before a lap six caution. On the restart, Rath-Wald dove low under McCleary to take the lead but McCleary battled back and they continued to race side by side for the lead. As Vetter lurked in third close behind the leaders, it was a four car battle for fourth between Josh Anderson, Jaren Wald, Maher and Nathan Messer. While racing for fourth, Maher's tight car spun out from underneath him and brought out a caution with five laps to go. Rath-Wald and McCleary continued to battle for the win as they raced side by side. The low line was the fast line for Rath-Wald but McCleary grabbed the lead with three laps to go. 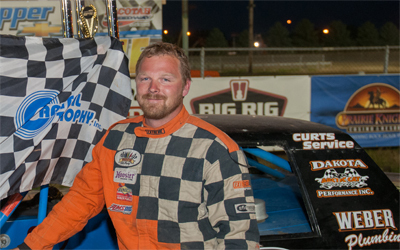 However, the low line would prevail as Rath-Wald won by inches over McCleary to win his fifth feature at the Dacotah Speedway. Brent Vetter finished third as Nathan Messer finished fourth ahead of Josh Anderson. Glen Ullin's Adam Meuchel started on the pole for the INEX Legends feature. It was a three car battle for the lead between Meuc hel, Tom Wagner and Paul Morman. 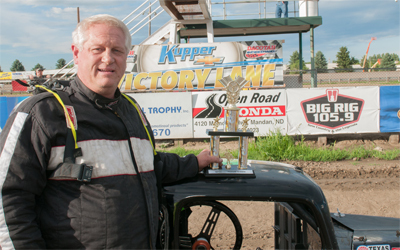 Morman's low line propelled him into the lead as Wagner, Steven Kuntz and Donavin Wiest raced three wide behind him. Kuntz shuffled into second and into the lead on lap three leaving Morman to battle Wagner and Wiest for second. Wiest hugged the guardrail which gave him the drive off the corner to take second and inch closer and closer to leader Kuntz. Kuntz and Wiest briefly raced side by side before the Wiest took the lead with nine laps to go. Third place Morman quickly caught Kuntz and passed him for second with six laps to go. Kuntz continued to lose positions as he lost third to Minot's Shane Williams. Morman and Williams reeled in the leader Wiest but Wiest's low line would hold them off. 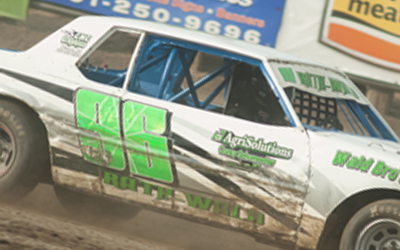 Donavin Wiest won his third feature of the season over Paul Morman and Shane Williams. Steven Kuntz hung on to finish fourth ahead of Troy Hoff. After a complete restart, the low line gave third place Shawn Volk the drive off the corner to take the lead in the WISSOTA Street Stock feature. Volk's lead was short lived as Wishek's Chris Michaelsohn powered band into the lead three laps later. Volk had his hands full with Eric Harpole and Shawn Becker for second. Becker shuffled into second before getting loose and having mechanical problems that ended his night early. As Volk and Harpole raced side by side, it allowed Allen Frederick to catch them and make it a three car battle for second. After racing door to door for many laps, Harpole grabbed second, bringing Frederick with him. Harpole and Frederick now raced side by side for second has Volk followed close behind in fourth. Frederick cleared Harpole for second with six laps to go but Harpole rallied back and retook the position with four laps to go. However, no one could catch Michaelsohn who went on to win three seconds ahead of Eric Harpole and Allen Frederick. Shawn Volk held off a last lap challenge from Zach Frederick to finish fourth. In the final feature of the night, Jay Tooley led from the pole as Rusty Kollman, Tracy Domagala and Spencer Wilson raced three wide for second in the IMCA Modified feature. Wilson, the fastest car on track,grabbed second and quickly reeled in leader Tooley to take the lead on lap four. Wilson pulled away as third place Domagala tried to hold of a strong Jeremy Keller and Jerad Thelen. They raced hard for several laps before Keller completed the pass on lap 12, bringing Thelen and Shawn Strand with him. Strand slipped by Thelen for fourth but Thelen stayed hot on his trail. Keller, Strand and Thelen quickly chased down second place Tooley and freight trained Tooley with ten laps to go. Lapped traffic became a problem as Keller and Strand raced side by side for second. With four laps to go, Strand made contact with Dylan Barnhardt, spinning out both drivers out and collecting fifth place Mark Dahl. Strand was charged for the caution and sent to the back. On the restart, Thelen dove low under Keller to grab second but Keller battled back to retake the position with two laps to go. The wiley veteran, Marlyn Seidler, blew by Thelen coming to the white flag. Thelen threw his car hard into turns three and four but Marlyn had the momentum of the corner to hang on to finish third. Jeremy Keller finished a season best of second place behind feature winner Spencer Wilson while Tracy Domagala rounded out the top five. Points leader Shawn Strand, who restarted last, stormed through the field to finish eleventh. Get ready race fans for the 25th running the North Dakota Governor's Cup presented by Budweiser, distributed by McQuade Distributing. 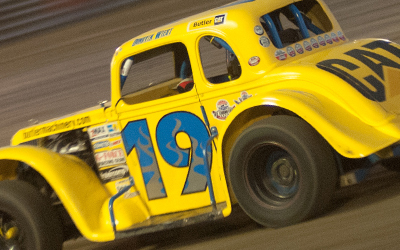 Two big days of racing on the high banks of Dacotah Speedway. Friday, July 24th Fan Gate opens at 6pm, Pit Gate opens at 3pm, racing at 7pm. 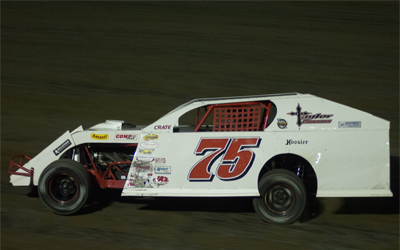 · IMCA Modified make up feature from June 19th. Saturday, July 25th Fan Gate opens at 4pm, Pit Gate opens at 3pm, racing at 6pm. The Late Model Simulator from RU Racing both days, with a chance to be entered in a drawing for a garage party on Saturday entered by fastest lap time.